Home / Function / Mega Food Park inaugurated at Dabwala Kalan, in Fazilka District Punjab. Mega Food Park inaugurated at Dabwala Kalan, in Fazilka District Punjab. 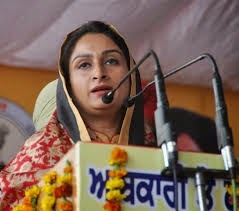 Union Minister for Food Processing Industries,Smt Harsimrat Kaur Badal inaugurated the first of its kind Rs 136 Crore Mega International Food Park at Dabwala Kalan, in Fazilka District Punjab in the presence of Deputy Chief Minister of Punjab Sukhbir Singh Badal today. Inaugurating the food park, which is among the fourth such parks in the country, the Union Minister gave a clarion call for establishment of more food processing units to reduce the huge food wastage worth Rs 45,000 crores in the country. She said that "This is just the beginning. The Ministry has succeeded in promoting International Food Park by extending a subsidy of Rs 50 crore. In the near future you will see many more parks and food processing units coming up in the State", she said while addressing public gathering on the occasion. Giving details of forthcoming projects in Punjab, Smt Badal said ITC was coming up with a Rs 1,000 crore food park in Kapurthala. "We are also promoting establishment of a cold chain for which we are giving a subsidy of Rs 10 crore besides creation of modern processing centres for milk, fruits and vegetables", she added. Urging farmers to add value to their crops she said they could also form small self help groups for this purpose. Making out a case for diversifying from paddy cultivation, Smt Badal said the need of the hour was to add value to fruits and vegetables grown in Punjab. Sh Badal lauded the food park promoters for providing more than 700 jobs to local youth and said more youngsters would be employed in the park once other companies also established their units in the 55 acre facility. The 55 acre food park has come up at a cost of Rs 136 crore having facilities for processing milk and milk products besides packaging vegetables and fruits. The current Winter session of Parliament is set for a record performance in transaction of legislative business. While the Lok Sabha has already passed 13 Bills in the first three weeks of the session ending on December 12, 2014, the Rajya Sabha has cleared nine of them. Rajya Sabha is still to take up four Bills passed by the Lower House viz., The Appropriation Bill,2014, Payments and Settlement Systems (Amendment) Bill, 2014,The Repealing and Amending (Second) Bill, 2014 and The Coal Mines (Special Provisions) Bill, 2014. The legislative business transacted during the 15 sittings of the current winter session so far and the Bills likely to be taken up during the remainder of the session of 7 sittings will surpass by a wide margin the 12 Bills passed during the Budget session this year. The fourth week of winter session of Parliament beginning Monday i.e December 15, 2014 assumes importance with the government proposing to move reform oriented Bills like The Insurance Laws (Amendment) Bill, 2008 and The Companies (Amendment) Bill, 2014 to be taken up for consideration and passing in both the Houses of Parliament. While the Insurance Bill seeks to enhance FDI limit in the capital starved insurance sector, the Companies Bill aims at enhancing the ease of doing business. The Lok Pal and Lok Ayuktas (Amendment) Bill, 2014 is also proposed to be taken in both the Houses. In addition, the Bills proposed by the Government for consideration and passing in the Lok Sabha during the remainder of the session include: The Regional Rural Banks (Amendment) Bill, 2014, The National Capital Territory of Delhi Laws (Special Provisions) Amendment Bill, 2014,The Public Premises (Eviction of Unauthorised Occupants) Bill, 2014, The Anti-Hijacking (Amendment) Bill, 2010 and The Warehousing Corporation (Amendment) Bill, 2014. In addition to the four Bills to be discussed in the Rajya Sabha as passed by the Lower House mentioned above, the Business Advisory Committee of Rajya Sabha has also allocated time for consideration of The Anti-Hijacking (Amendment) Bill, 2010 and The Public Premises Bill, 2014. Time has also been allocated for taking up two motions in Rajya Sabha relating to annulment and modification of the central government’s notification of December 2, 2014 seeking to increase the Basic Excise Duty on petrol and diesel. Rajya Sabha lags behind the Lower House in terms of number of Bills passed on account of continuous disruptions for four days during the second week of the winter session on the issue of some observations made by a member of the union council of ministers.